The whole mistaken premise of this housing white paper is to “build more homes to slow the rise in housing costs. We need to build many more houses, of the type people want to live in, in the places they want to live.” How many times did we hear that one? Yet it is that very demand, fuelled by ultra-low interest rates and government subsidy, that further stimulated demand, exceeding supply with the resultant increase in prices. This is what markets do. Rising housing costs are systematic of years of political economic interference and meddling. If prices are unaffordable, measures put in place that subsidise housing will only serve to enable price increases to continue. 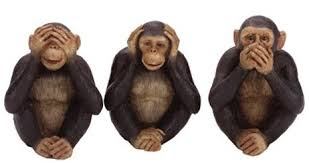 Think housing benefit, low interest rates, help to buy, quantitative easing. All of these contributed significantly to Mr Javid’s “broken housing market” and his housing white paper won’t be fixing it anytime soon. 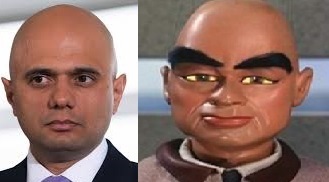 What was needed was an honest admission from Mr Javid that the private market alone will not build the 250,000 new homes each year needed to meet the government’s target of one million new homes by 2020. Loosening the planning system even further and helping smaller builders will not alter the fact that out of the 270,000 homes that are approved through the planning process each year, less than half are actually built. In fact I would go further and suggest even if planning was no longer required at all, Britain would still have a housing crisis! Since the 1970’s, Britain has added on average just 160,000 new homes a year, well below the 250,000 “target”. 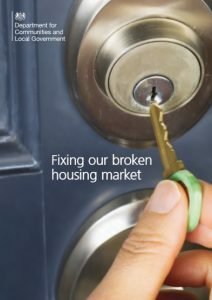 Thirteen years ago Dame Kate Barker, now an independent non-executive director at Taylor Wimpey, warned of the crisis to come with the first large-scale report into the shortfall of housing provision. At the time she said 245,000 homes a year would be required to keep house price inflation at 1.1%, but average house prices have risen 50% since then. The Lyons review in 2014 revealed a shortfall of 1 million homes. Landbanking is a reality, not a myth! No wonder shares in Britain’s listed housebuilders rallied as few believe this housing white paper will make any big difference. Most disappointingly of all, was the total absence of any measures to tackle the dire quality of the new homes that are actually being built. It is pointless having a plan to build even more new homes if new homes are soon demolished because quality standards were so poor. 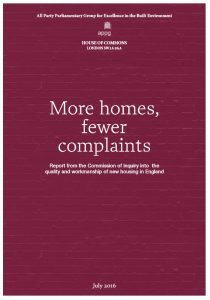 “More Homes, Fewer Complaints.” Retrospectively, a better, more accurate title could have been “Fewer Homes, More Complaints! There will be more on the main points of the housing white paper such as it is, to follow. Watch this space! This entry was posted in New Homes and tagged APPG Inquiry Into Quality of New Homes, house builders, new homes ombudsman, planning, quality. Bookmark the permalink.